A Valastro Valentine’s Day tradition! Meanwhile, saute the garlic in the olive oil over medium-low heat until softened, 2 to 3 minutes. Add the bottled clam juice and season lightly with salt. Drain the pasta and return it to the empty pot. Add the clam sauce, lemon, and half the parsley to the pot (reserve the clams): toss with tongs to coat and moisten. 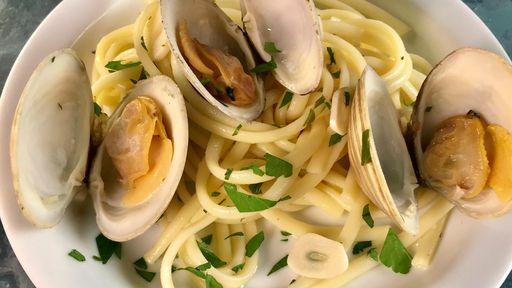 Note: If the clams are large, chop half or all of the clam meat and mix into the pasta: discard any empty shells. Al Dente: Al dente means “to the tooth,” and it’s how we Italians like to eat our pasta. To achieve al dente pasta, a good rule of thumb is to shave a minute or two from the cooking time on the box. Tip: If your local market does not carry clam juice, substitute with seafood stock!